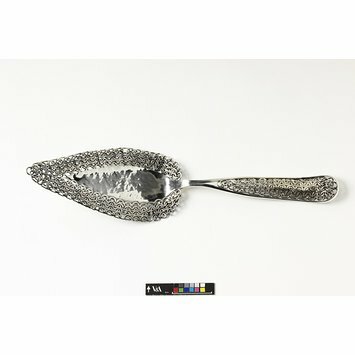 The traditional trowel shape of this server strikingly contrasts with the original and contemporary chain-mail decoration. The elegant form of this slice is composed of a hammered sheet panel blade that rises in an elegant curve and splits to form the edging of the handle. The chain-mail perimeter of the blade is balanced by the chain-mail interior of the handle. Interlocking rings hammered flat and bevelled at the edges create this striking effect. The war-like connotations of this decoration seem contradictory to our preconceptions of dining as an entertaining and relaxed activity. This beautifully integrated piece is both original and timeless. The slice is of classic trowel 18th century shape, but is quite otherwise in construction and design. The blade is made with an outer fused chain-mail perimeter of interlocking rings that are hammered flat and bevelled at the edges. The chain-mail surrounds a central, hammered sheet panel that lifts and splits to become the heavy edge wire surround of a long, flat handle composed of a central convex, fused chain-mail panel. Historical significance: Gray's work explores the insight into social attitudes that can be elicited from presentation objects. Changes in design and manufacture have many ideological implications that interest Gray. Through her work Gray aims to define a historical and social era. In this fish slice "utility becomes a vehicle for ideas about craft and form". 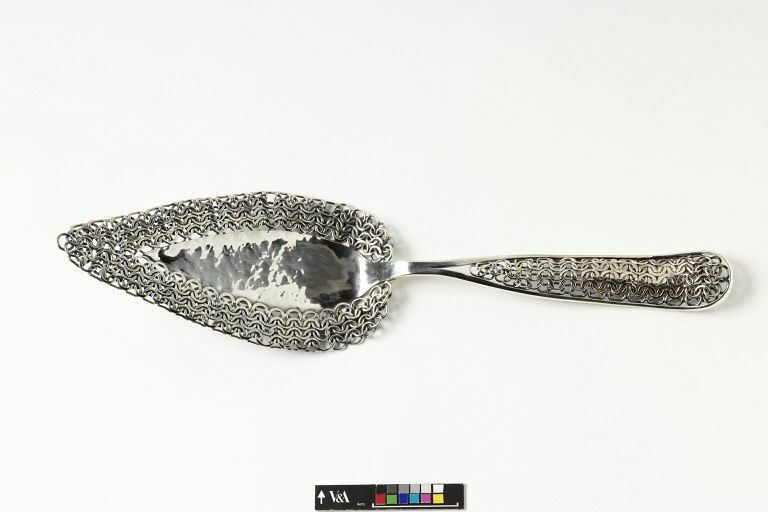 Sterling silver, USA, New Paltz, New York, 2000, designed and made by Myra Mimlitsch Gray. Benton Seymour Rabinovitch, Contemporary Silver, Part II: Recent Commissions, Seattle, 2005, pp. 56-7. ill.